A fire, which left a Polish family in Coleraine homeless, may have been started deliberately, say the PSNI. Last Sunday at around 4am the fire spread from an oil tank to a house on the Ballycastle Road. A man, a woman and a small child were taken to hospital and treated for smoke inhalation. The occupants and neighbours were moved from their homes while fire crews tackled the blaze. Substantial damage was caused to the house. PSNI Detective Sergeant Kelly Gallagher said: “Following enquiries, it is believed that this fire may have been started deliberately. 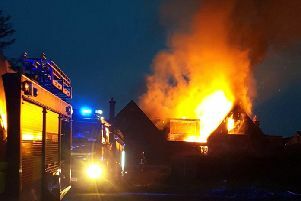 Last week a Northern Ireland Fire and Rescue Service spokesman said: “Fire crews from Coleraine,Portrush, Ballymoney and Portstewart attended the incident which was necessary to quickly attack and contain the large fire at the back of the premises. “Neighbours had raised the alarm to ourselves and police and gained entry to the premises to alert the occupants who were a young family with a young child. “Fire crews wearing breathing apparatus searched adjoining houses which were filling with smoke and residents including those with young children had to be evacuated for safety reasons.